It’s the season for IDTech’s conferences, so time for another look at the Printed Electronics (PE) opportunity. At the Europe conference this year, the IDTech’s team drew a distinction between past successes with simple screen printed products such as membrane keyboards and the current thrust for higher functionality. It’s the season for IDTech’s conferences, so time for another look at the Printed Electronics (PE) opportunity. At the Europe conference this year, the IDTech’s team drew a distinction between past successes with simple screen printed products such as membrane keyboards and the current thrust for higher functionality. Companies such as HP Labs, PARC, and PolyIC, are building active transistor based devices that all seem to be able to yield few hundred transistors even though each company is taking a different approach to building devices by roll to roll processing. The transistor count of a few hundred transistors is not sufficient to open up markets for consumer products where we have been spoiled by eye catching displays. 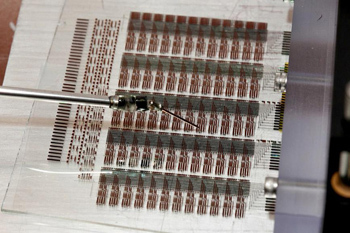 HP Labs have made working 20,000 transistor devices using plastic film mounted to solid substrates so that they can use low defect wafer deposition systems. They are relying on process innovation to make conventional Thin Film Transistors on flexible substrates, using their SAIL process that has always appealed to me as an interesting strategy . It looks to me that there is one more cycle of improvement before really interesting products emerge. The other emerging trend that it is the new materials for conductors, memory, and semiconductors that are enabling many new products. In order to demonstrate commercial viability, materials innovators are having to become more vertically integrated product developers. Success has it rewards, as seen in 3M’s acquisition of Printechnologics memory material and technology. By 2022, the biggest market segment is projected as OLED displays at $30B. It is easy to believe that a full color flexible sheet display will have wide consumer impact. However it does require low temperature process-able OLED materials which provide a key development challenge, and the highest pixel count TFT backplanes. I have always felt that process development solutions are much easier to plan around than optimizing a new material. However new materials are much easier to IP protect and enforce once they are developed. Whatever path wins out, the opportunity for thin flexible low cost electronics still looks huge to me. Mike Watts has been patterning since 1 um was the critical barrier, in other words for a longtime. I am a tall limey who is failing to develop a Texas accent here in Austin. I have a consulting shingle at www.impattern.com.